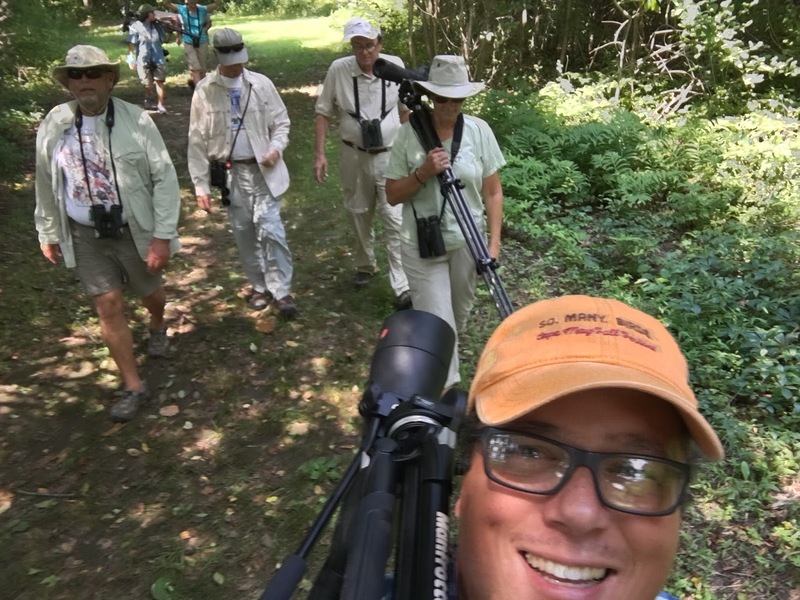 July is sometimes thought of as a slow month for birding, but shorebird migration is ON in a major way in the Cape May area, with new birds arriving from the northern breeding grounds in the boreal forest and Arctic tundra each day. 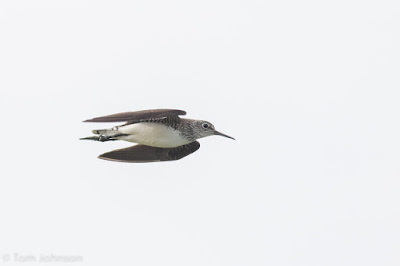 In a series of posts, we will focus on a few species of shorebirds to help get us ready to identify and enjoy watching these migration athletes in flight! 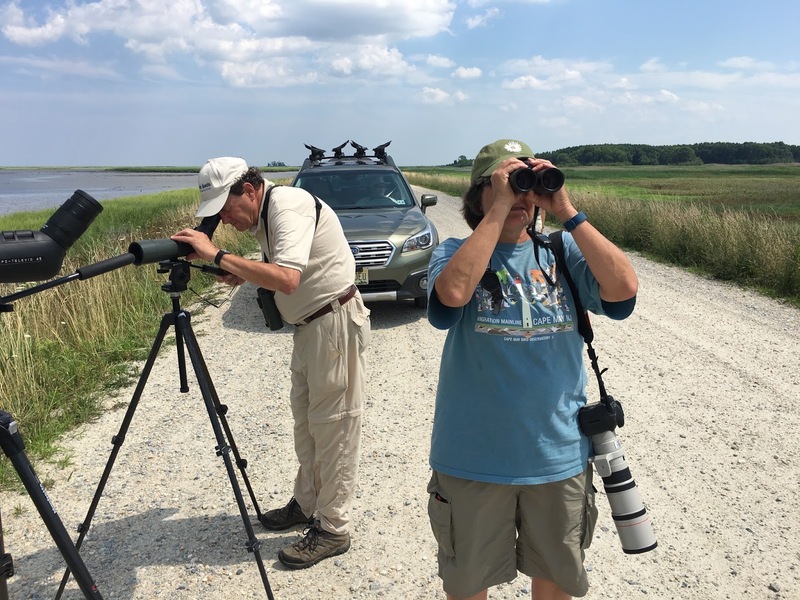 Solitary Sandpipers have started to move through the mid-Atlantic region on their southbound migration, though they are a bit harder to detect than the obvious flocks of yellowlegs and dowitchers that are rushing through along the coast right now. Solitary Sandpipers tend to migrate in a, well, solitary fashion, and it's fairly easy to overlook one. 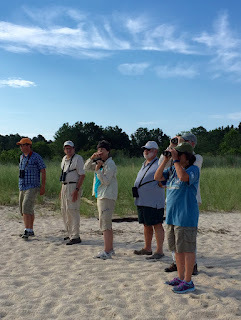 One tip that can help you detect and identify more Solitary Sandpipers is simple - learn the flight call! The thin, high flight call is typically doubled in a piercing "Tsee-Tsee! ", higher and apparently less variable than similar calls given by Spotted Sandpipers. The flight calls on the recording starting at the 15 second mark are the ones that I hear most frequently on migration. So, you hear that sharp "Tsee-Tsee!" call - what next? Look up! Typically, a Solitary Sandpiper makes that doubled call in flight. Dawn and dusk are particularly good times to see these shorebirds flying over, but it can happen at any time of day. Solitary Sandpipers are small members of the genus Tringa, the same genus that includes the yellowlegs and Willet (and a number of Old World species that we won't discuss here). 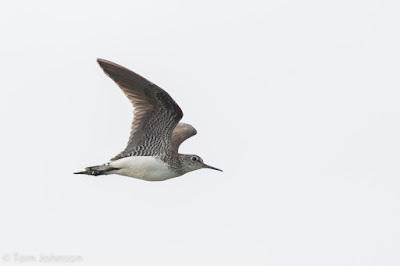 Yellowlegs, Lessers in particular, are relatively similar in appearance to Solitary Sandpipers, but they are longer in wingspan and body length, with longer legs that stick out farther beyond the tail in flight (on Solitary, just the tips of the toes project beyond the tail in flight). 1) Dark underwing. The underwing coverts of a Solitary Sandpiper are barred dark and white, but in real life when a Solitary flies overhead rapidly, this pattern just appears really dark, contrasting strongly with the bird's white body. Yellowlegs have a lot more white in the barred underwing coverts, so their underwings don't contrast nearly as much with their white bodies. 2) Flight posture and style. 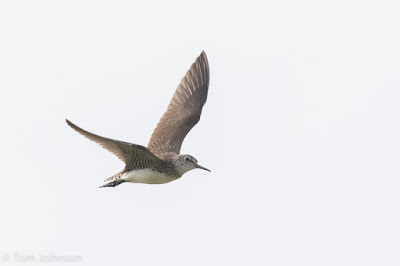 Solitary Sandpipers cover a lot of sky in flight while in a tucked position with the wings mostly folded in to the body. This gives the bird's flight a bounding look with the wings outstretched for relatively short periods of time during each quick flap. In comparison, yellowlegs have more regularly spaced wingbeats and aren't nearly as bounding in flight. These three photos are all of the same Solitary Sandpiper flying over at the Meadows (AKA The Nature Conservancy's Cape May Migratory Bird Refuge) in Cape May on 17 July 2016. 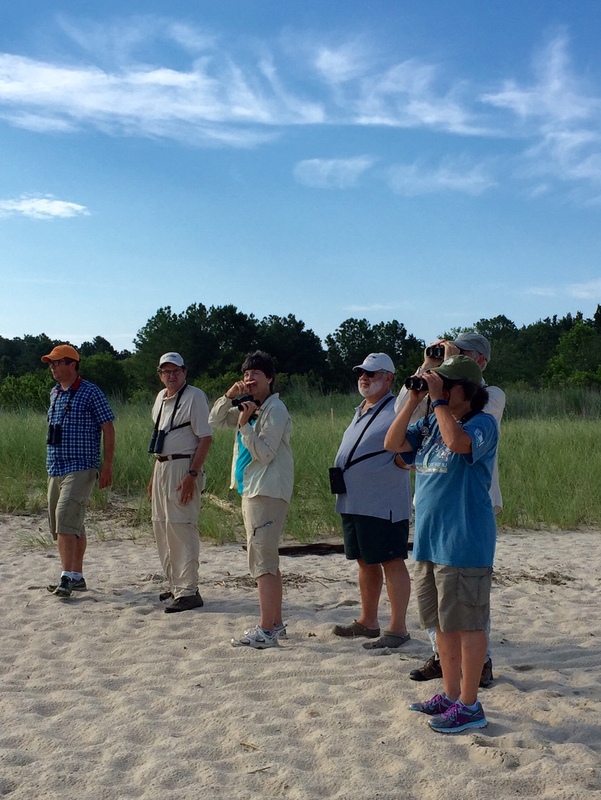 Check this space for more identification tips and updates on shorebird migration. Good luck out there!